This morning we woke up right at 5am to get in our long run of the week. And, as has been typical, it was already 80 degrees and thick, humid air. There was, at least, a light breeze. It was one of those runs that, from the beginning, I could tell wasn't going to play out as I'd hoped. My legs felt pretty heavy and it was not easy to breathe. Then I made a pretty big mistake by going too fast, too soon. Miles 2, 3 and 4 were all at just over a 9 min mile pace. Not exactly what I should have been doing for a long, EASY training run. By mile 5, I told Jason that I didn't want to go across the bridge by the Clinton Library. Going over is one thing, but then coming back with the steeper incline is another. And I was struggling big time. He had me check my heart rate and it was 173. Again, not exactly what you want for a long, easy run. I know that it was mostly due to the humidity and not getting in the oxygen I needed. He had me slow down and really focus on my breathing: exhaling hard to get out all the air so that I could actually take in deeper breaths. The problem I sometimes have with my asthma isn't suddenly not bing able to breathe, but this downward spiral of shorter and shorter breaths. In other words, less and less oxygen. All that leads to one big struggle. After I slowed down, got my breathing under control (for the moment), we tackled the bridge. It might have been my one moment of clarity and enjoyment. The breeze from the river felt amazing and the sunrise was spectacular. At mile 6.2 we stopped at a water spigot so I could refill my water bottle and take my GU. I should have stretched as my arches were starting to get tight. Oh yes, hello plantar fasciitis. We meet again and I hate you. We got moving and continued along the river then looped back towards the dreaded bridge. At mile 7.2 I told Jason I didn't want to run anymore. I was done. I didn't say "can't" just yet at least. I stopped and stretched my calves on the curb to try to stretch out my feet. Then back to it. Jason just kept reminding me to not power up the hill but take it slow and steady. So, 10.1 miles finished, but they were not easy, not the best at all. Did I feel accomplished at least? You bet. I didn't stop even though every fiber of my being wanted to stop. I did in fact finally say "I can't," but I did of course. But it was one of those runs where I started to question why I run, what I was doing, why I signed up for another half, was there a way to get out of that race....oh yes, all the negative thoughts about running came pouring into my head. And of course self-doubt. Why was this so hard. I've been working on tackling all these damn hills, acclimating to the heat. Shouldn't I be stronger not weaker? And the litany of doubt went on and on. As I was lying in the floor with my feet propped in the air (in front of the fan), I did have to remind myself that the humidity does affect me and my running. The heat affects me and my running. And so do the hills, the going out too fast, fatigue. But I didn't quit. I am not weak. I'm definitely stubborn enough to prove I can finish at least. So, I'm waiting for the runner's amnesia to kick in because I know I'll lace up and be right back out there again (probably tomorrow). It is Friday, and Fridays should be happy. So let's move on to some sunshine, also known as Fun Facts Friday. 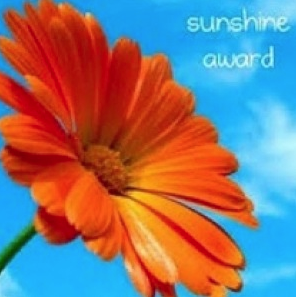 I recently received the Sunshine Award From Cory at Learning Patience. If you haven't checked out her blog, you really should. She's an amazing, upbeat, fabulous blogger. Favorite Animal? Koala bear because they're so darn cute - but in real life, a Cocker Spaniel of course. Giving or giving presents? Giving. I love buying for others and watching them receive the gift. Your turn, answer one (or all) of the above. I'd love to hear your response. And to complete the award, I do need to pass it along to some fab bloggers (this is always the hard part actually).